No longer just an old fashioned tradition, gloves return with all their glamour, chic and smartness. Now a must have part of every ladies Winter-panorama and for that matter Summer too. Ladies leather gloves must definitely be in smooth and supple leather, can be short or long and either classic dark shades or often colourful and charmingly decorated. The Aspinal Ladies Gloves Collection offers every stylish lady the most beautiful range of styles and palette. All of our ladies leather gloves are individually hand stitched from the finest Nappa kid skin in our workshops by our master leather craftsmen. 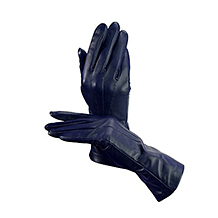 Most of our ladies leather gloves are available either unlined, lined in real silk or in 100% cashmere. All gloves come beautifully gift wrapped in an Aspinal signature gift presentation sleeve.